Stovepipe Wells (elevation, 10 feet above mean sea level) is a small way-station in the northern part of Death Valley, in unincorporated Inyo County, California. There is a motel with swimming pool, a gas station/general store, a gift shop, a ranger station, and a restaurant/bar, as well as a tent and RV campground. NO. 826 OLD STOVEPIPE WELLS - This waterhole, the only one in the sand dune area of Death Valley, was at the junction of the two Indian trails. During the bonanza days of Rhyolite and Skidoo, it was the only known water source on the cross-valley road. When sand obscured the spot, a length of stovepipe was inserted as a marker. NO. 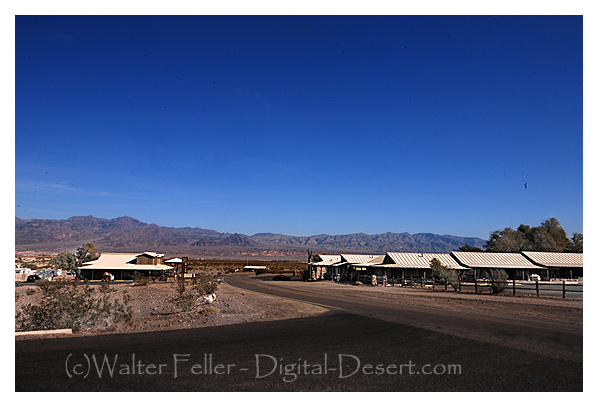 848 EICHBAUM TOLL ROAD - In 1926, H. W. Eichbaum obtained a franchise for a toll road from Darwin Falls to Stovepipe Wells, the first maintained road into Death Valley from the west. It changed the area's economic base from mining to tourism and brought about the creation of Death Valley National Monument seven years later. Tawny dunes smoothly rising nearly 100 feet from Mesquite Flat. Late afternoon light accentuates the ripples and patterns while morning is a good time to view tracks of nocturnal wildlife. Moonlight on the dunes can be magical, yet night explorers should be alert for sidewinder rattlesnakes during the warm season. This stream of salty water is the only home to a rare pupfish, Cyprinodon salinus. Springtime is best for viewing pupfish; in summer the lower stream dries up and in winter the fish are dormant. The wooden boardwalk loops ½ mile through stands of pickleweed and past pools reflecting badland hills. Wheelchair accessible.